Associate Professor Jason Hartline brought three visiting professors to Northwestern Engineering in spring. A student presents her research during one of the Special Quarter's update meetings. Graduate students discuss ways to combine machine learning with game theory and economics. As many of our interactions move online — from the shopping mall to Amazon, or from the local bar to Match.com — our transactions become quicker, more convenient. But to a new generation of computer scientists and economists, these transactions also offer a trove of data, which enables researchers to ask new questions related to market design, game theory, and machine learning, including: How should these systems, where humans are interacting with algorithms, be designed? Or which data-driven market analyses are computationally feasible? 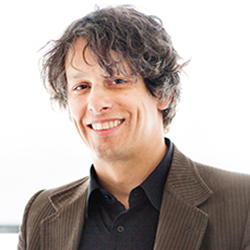 Those questions propel the work of Jason Hartline, associate professor of computer science at Northwestern Engineering who uses methodologies from computer science to understand and improve outcomes of economic systems. But while there are a few excellent research papers in this nascent area of using data science and machine learning in relation to economic systems, researchers have yet to coalesce around a broad research vision. So he and his colleagues in Northwestern Computer Science decided to bring three visiting professors and their graduate students to Northwestern for an intensive two months of research and workshops. The result was Special Quarter: Data Science and Online Markets, with the goal of charting new research directions for the field. Made possible by the Bill and Jeanne Bliss Visiting Professorship, the Chookaszian Family McCormick Computer Science Fund, and the McCormick Advisory Council Visiting Professorship Fund, the quarter brought together experts in game theory, machine learning, and econometrics and resulted in several research projects that participants say could only result from close physical proximity and an intense opening launch. Online marketplaces include traditional buy/sell marketplaces but also extend to any system where users both contribute and consume — think sharing economy companies like Uber and Airbnb, or even the free online encyclopedia Wikipedia. Many Northwestern computer science graduates go on to work as software engineers for these companies, but Hartline found students often weren’t prepared for such positions. “If this is what our undergraduates are going to end up working in, we need to teach them how to understand market data and how to evaluate market designs and how changes would affect the marketplace,” Hartline said. To be able to better teach students, Hartline realized there needed to be better direction in the research community. Jacob Abernethy (Bill and Jeanne Bliss Visiting Assistant Professor), an assistant professor in computer science at Georgia Tech whose research interest is in machine learning, with a particular focus in sequential decision making, online learning, online algorithms, and adversarial learning models. Constantinos Daskalakis Bill and Jeanne Bliss Visiting Associate Professor), an associate professor of computer science and electrical engineering at MIT whose research interests lie in theoretical computer science and its interface with economics, probability, learning, and statistics. Denis Nekipelov (McCormick Advisory Council Visiting Associate Professor), an associate professor of economics and computer science at the University of Virginia whose research interests include econometrics and the analysis and theory of scalable and efficient techniques that can be used to estimate the models of strategic behavior in data-rich settings. Through the quarter, the researchers held workshops and laid out plans for different combinations of students and faculty to work together on specific research projects. They all came together twice a week to give updates on their progress. 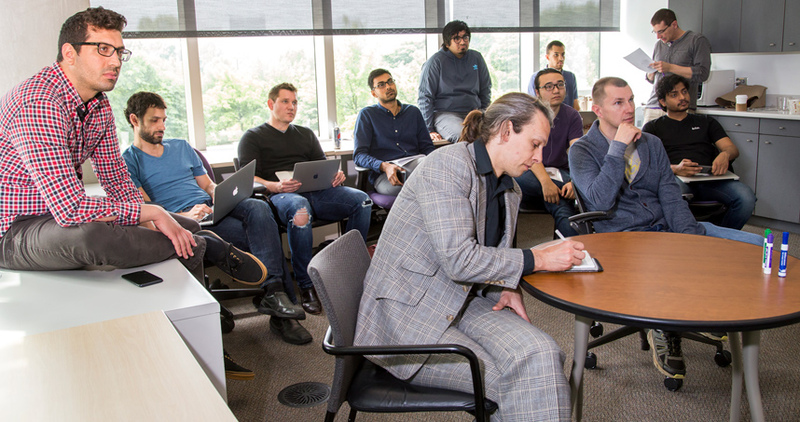 They also brought in visiting researchers from academia and industry and collaborated with other faculty at Northwestern, including economics faculty from the Weinberg College of Arts and Sciences and the Kellogg School of Management. Laying the groundwork for the projects were the 11 graduate students, who took the initial research questions, iterated and reposed them, and even took time to get together to play The Resistance, a game of social deduction that was popular among the group’s game theorists. The role of dashboards in online marketplaces: How can the design of dashboards help sellers or buyers optimize their outcomes? How do you display information that helps users understand the system, or understand better how different actions might create different outcomes. The role of algorithms in markets: Agents in markets often delegate tasks to algorithms. Used books on Amazon, for example, are often automatically repriced based on supply and demand. How can we best design markets to take the role of algorithms into account. Econometrics and networks: The field of econometrics tries to find the market conditions that cause certain outcomes. But take, for example, the problem of airlines creating a new route from Chicago to Los Angeles. They cannot consider just the market between the two cities, because that doesn’t take into consideration the potential for a Chicago layover between New York and Los Angeles. The market is actually a network. How can economists and computer scientists create models for understanding these network effects. Competitive prediction settings: When people develop predictions – about the stock market, or about the weather – one might think they would strive for high accuracy. But some forecasters might lean toward more extreme predictions, so if they are correct, they could be seen as a champion with extreme foresight. How do you understand and model that behavior in the context of markets. Computational complexity of econometrics problems: Computers are not all-powerful machines with the ability to compute anything. Certain econometrics problems are so vast, with so many different outcomes, that straightforward computational methods are unable to solve them. This project aims to either find computationally efficient algorithms or prove that none exist and study approximate solutions. After the quarter was over, the researchers made plans to continue to meet throughout the next year to maintain momentum, with the goal of having at least a half-dozen papers come out of the collaboration of the special quarter. “Incorporating machine learning and game theory into economics is a type of research we are trying to forge,” Daskalakis said. “Ultimately we want to help design systems that result in good welfare for society."